Warm leggings to Keep You Cozy During the cold months, especially at wintertime when it is really cold and snowy, the thought of getting dressed up in tight skinny jeans or a favourite skirt can be depressing. On these harsh days there is nothing better than put on a pair of comfortable and cozy warm leggings whether you are out running errands or on the fourth season of the new TV series. The best thing is, you can pair your warm leggings with sneakers and a sporty coat or with a cozy, oversized sweater and high boots, it’s up to you. 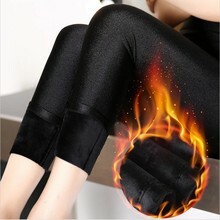 If you can’t live without sports activities even in winter, a pair of warm leggings is an excellent option. They will help keep you warm during cool-weather workouts and long running in cold weather conditions. So what is the difference between regular leggings and warm leggings? Warm leggings are exactly like regular, but are lined with fleece, a fabric that insulates. The fleece feels very soft and nice. We can assure you, that you will be at your warmest even when it is freezing outside. These leggings are thin but warm, so even though they are lined, you will not feel uncomfortable and bulky. Discover our warm leggings’ collection Our warm leggings’ range is exactly what you need on crisp, chilly day. They're a simple way to maintain your ideal body temperature, even on the coldest days. These leggings provide a perfect fit that hugs your body and moves with you. They are modern, stylish, cozy, warm and bulk-free at the same time. Do you think it is impossible? We can tell you, it’s not. Don’t hesitate and check out our collection. You will find different styles, great variety of sizes and fabulous colors. Here we should add that our warm leggings are also opaque, meaning you can wear shorter shirts and sweaters and very durable, absolutely no pilling or losing shape or color after a few wears.